Unlock a bright and beautiful life in Jaipur with Siddha Aangan today! To savour every moment of a fun filled life, come to Siddha Aangan’s Baya. Located on Ajmer Road, Jaipur, the Baya tower offers homes where homeowners can spread their wings and live life king size. Spread your wings in spacious 1, 1.5 & 2 BHK affordable flats in the Gated Siddha Aangan Township and enjoy a comfortable lifestyle amidst the open garden. Baya is the latest addition to the Siddha Aangan Family offering reasonably priced flats on Ajmer road. Situated on the Bagru Khurd Link Road, before the Toll Plaza on Ajmer Road, Jaipur, Rajasthan, this Township is the best place to unwind in comfort. 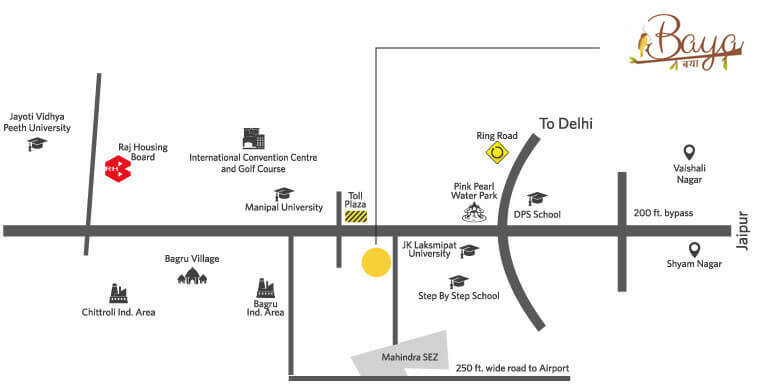 The Township is situated within the close vicinity of reputed schools, colleges and universities, i.e., Delhi Public School (DPS), Step by Step International School, Rajasthan Dental College, Manipal University, JK Lakshmipat University Institute of Engineering & Technology, JK Lakshmipat University Institute of Management and Rajasthan College of Engineering for Women, RIICO Bagru (Govt Industrial Area at Bagru) and so on.